Helene was discovered by P. Laques and J. Lecacheus on March 1, 1980 through ground based observations during the Earth ring-plane crossing. Helene is called a Dione Trojan satellite because it shares the same orbit as Dione at about 60 degrees ahead of its larger companion. 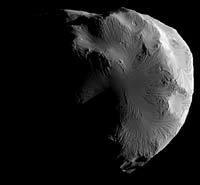 Its diameter is about 36 x 32 x 30 kilometers (22 x 20 x 19 miles). 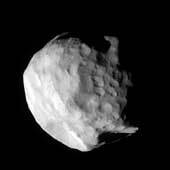 The Cassini spacecraft snapped this image of Saturn's moon Helene while completing the mission's second-closest encounter of the moon on June 18, 2011. Although Cassini's closest flyby of Helene was in March 2010, this June 2011 flyby yielded some of the highest resolution images of the moon. Lit terrain seen here is on the leading hemisphere of Helene (33 kilometers, or 21 miles across). North on Helene is up. This small moon leads Dione by 60 degrees in the moons' shared orbit. 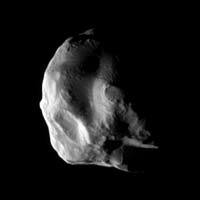 Helene is a "Trojan" moon of Dione, named for the Trojan asteroids that orbit 60 degrees ahead of and behind Jupiter as it circles the Sun. 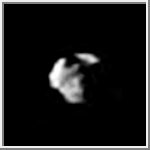 Although travelling at great speed, the Cassini spacecraft managed to capture this close view of Saturn's small moon Helene during a flyby on March 3, 2010. Saturn's atmosphere makes up the background of this composition. 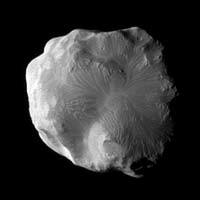 This view looks toward the anti-Saturn side of Helene (33 kilometers, or 21 miles across). North on Helene is up and rotated 44 degrees to the right. The Cassini spacecraft reveals details on the surface of small, irregularly shaped Helene in this close-up view, obtained during the spacecraft's closest encounter with this moon during its four-year primary mission. Helene (32 kilometers, or 20 miles across) is a Trojan moon, sharing Dione's orbit but staying 60 degrees or 400,000 kilometers (250,000 miles) ahead of the much larger moon. This set of images exposes details on small and crumpled-looking Helene. Large portions of this Trojan moon of Dione appear to have been blasted away by impacts. 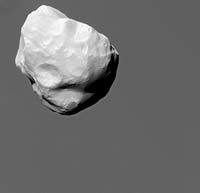 Cassini passed within 50,000 kilometers (31,000 miles) of Helene (32 kilometers, or 20 miles across) on Aug. 17, 2006, when these images were acquired. The views were obtained over the course of an hour, and are presented here in reverse order (i.e., the leftmost image was taken latest). Views of the Solar System Copyright © 1997-2011 by Calvin J. Hamilton. All rights reserved. Privacy Statement.